Enjoy a paddle around the Bayfront, Canal Park, and Duluth Lift Bridge areas, but be sure to keep a 300 foot distance from the tugs, ore boats, and “salties” (international boats). 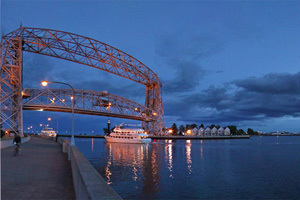 Experience the Duluth/Superior entrance and explore the Saint Louis River Estuary. This 12,000 acre freshwater estuary is the largest U.S. tributary to Lake Superior and like none other in the Great Lakes. This area boasts an unusual array of high quality coastal wetlands, old growth forests, diverse fisheries, streams, baymouth bars, sand dunes, and a critical mid-continent bird flyway and nesting ground. Wildernesses areas lie within the largest active harbor on the Great Lakes. 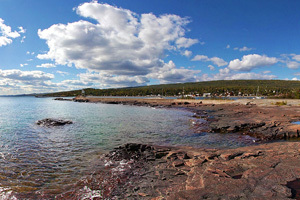 Great paddling opportunities abound at Two Harbors. At Burlington Beach and Agate Bay, launch your kayak and paddle from harbor to harbor in view of working ore docks, shoreline rock-outcrops, historic lighthouse, the Corps of Engineers breakwall, and city parks and trails. The city campground is adjacent to a cobble beach where you may launch your kayak. 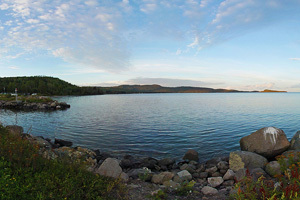 At the mouth of the Gooseberry River there are two Lake Superior State Water Trail campsites, each with a fire ring and picnic table. Relax and enjoy the beaches and rocky shoreline adjacent to the campsite, or paddle or hike a short distance upstream to view waterfalls. Other nearby facilities include: two Civilian Conservation Corps log and stone picnic shelters, the Gitchi-Gami State Trail, and Gooseberry Falls State Park campground (reservations available). For more information visit the park webpage. 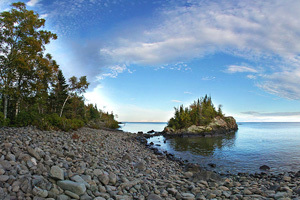 This pebble beach at Split Rock Lighthouse State Park provides the perfect day-use area for practicing paddling skills or skipping stones in the protected bay. In the distance, Ellingson Island and Split Rock Lighthouse can be seen. Several picnic sites and a trail center building are tucked in the woods nearby. Camping is available at the park’s cart-in campground or at several more remote kayak-accessible campsites (reservations available). For more information visit the park webpage. Easy launching is available at the Silver Bay Marina. From here, you can paddle past rugged shoreline and the historic Hesper shipwreck. Watch for ore boats loading at the pellet plant just up the shore from the marina, and be sure to keep a 300 foot distance when they are in the area. Explore the bay and the mouth of the Beaver River just 1.5 miles west of the marina, or visit a unique black-rock beach about 3.5 miles up the shore from the ore docks. This large rock formation on the North Shore of Lake Superior is formed from a lava flow which was extruded some 1.1 billion years ago. This lava flow formed both Palisade Head and Shovel Point about two miles to the east. 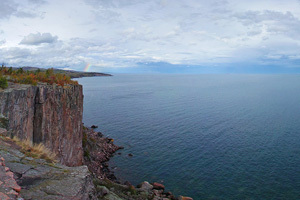 The high point is over 300 feet above the level of the lake and the lakeside cliffs are several hundred feet above water level. 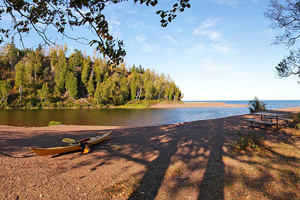 Boat launching is available at Tettegouche State Park. For more information visit the park webpage. 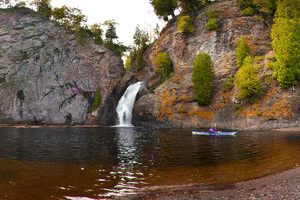 About nine miles southwest of Taconite Harbor and nine miles northeast of Tettegouche State Park, the Manitou River empties into Lake Superior at a small pool with a sand bar and rock cliffs. This is one of the few waterfalls that drop directly into Lake Superior on Minnesota’s North Shore. Plan for a full day of paddling to get to and from this spot, and make sure you know the forecast as there are few landings along the route. Be sure to check the DNR Lake Superior State Water Trail website for more information. 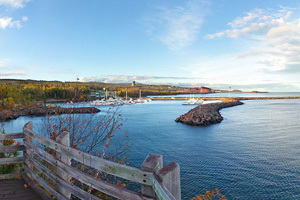 Wonderful paddling, camping, and launching opportunities exist at Grand Marais where the harbor is protected by the Corps of Engineers’ breakwall and navigation lights. The nearby city campground offers great access to protected launching sites, and many local services (lodging, accommodations, etc.) are available. Picturesque rock outcropping and rugged shoreline await paddlers who explore the area. 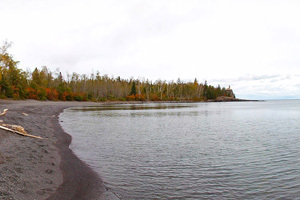 The public water access at Horseshoe Bay (about 20 miles northeast of Grand Marais and 17 miles southwest of Grand Portage) has a nice primitive campsite and boat-launching area with remote shoreline and rock cliffs nearby. Located just up the shore from the community of Hovland, this site has a small island that shelters the campsite from northeast winds and offers remote shoreline access. 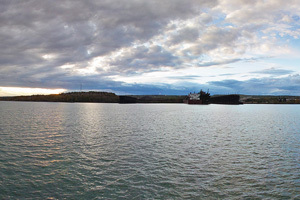 This view is from the Tribal Marina on Grand Portage Bay, within the Grand Portage Indian Reservation. Grand Portage Island is visible to the right-center in the scene highlighted by sunshine. All land and islands ten miles east and ten miles west of this scene are non-public lands under the jurisdiction of the Grand Portage Band of Lake Superior Chippewa. Day trips from this access point are possible. Camping and other access on Reservation land (outside the campground) is restricted. For more information contact the marina and campground office of the Grand Portage Reservation.